A quick look back down the stairs we just climbed. 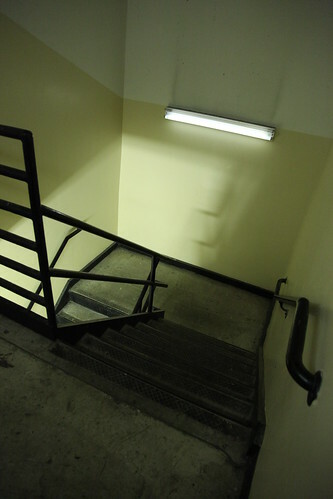 One of the lesser used stairwells in the mall, this stairwell provided access to only four stores on the first floor. Remember, the Nanuet Mall was built in 1969, so the stores on the first floor were only served by a "fire trap" corridor with no first-floor exits. So, in the event of an emergency, you could only run out the front of the store. If you ran out the back of the store, you'd have to climb this stairwell to safety (or take the 1969 vintage Dover elevator that likely had no fire service [note: never actually do this]).